Kundu S, Mitra R, Majumdar A, Saha S, Misra S. Primary Lymphoepithelioma-like Carcinoma of the Lung in a 13 year old Girl. Oman Med J 2012 Jan; 27(1). Keywords: primary lymphoepithelioma-like carcinoma of the lung. Primary Lymphoepithelioma like carcinoma (LELC) of lung is a very rare disease. Since the first reported case in 1987,1 just 150 cases have been reported.2 Originally described in nasopharynx, lymphoepitheliomas are undifferentiated carcinomas with predominant lymphoid infiltration. Recently this tumor has been described in a number of other sites. An association with prior infection by Epstein-Barr virus has been recognized in cases from nasopharynx as well as its lung counterpart.3,4 Such primary lung neoplasms are much rarer in children & the adolescent age group.5 Here we report an uncommon case of primary pulmonary LELC in a 13-year-old girl of Indian origin. 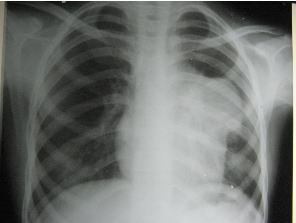 A 13 year old girl presented with low grade intermittent fever and cough with scanty mucoid sputum for 6 months and progressive shortness of breath and heaviness in the left side of chest for 4 months. She had no history of muscle weakness,diabetes, hypertension or tuberculosis. On examination, she had pallor without any palpable lymphadenopathy and dull note on percussion in left mammary region with diminished vesicular breath sound. Her X- ray Chest PA view (figure 1) showed left hilar mass and contrast enhanced CT scan of thorax (Figure 2) revealed a large heterogenous lobulated enhancing mass in antero-superior mediastenum. CT guided FNAC showed biphasic population of cells. Epithelial component had oval to spindle shaped nuclei, pale cytoplasm, indistinct cytoplasmic border and epithelial cells were admixed with lymphoid cells. Initially a provisional diagnosis of Thymoma was made. Repetitive nerve stimulation test was within normal limit. She underwent left lung upper lobectomy and the tumour measured to be 14 x 9 x 5 cm in size was removed. Histopathological examination of the lung tumor (figure 3) showed sheets and nests of epithelial cells separated by stroma rich in plasma cells and lymphocytes that also extend into the tumor aggregates involving the overlying pleura. The bronchial cut margin was free of lesion. All lymphnodes showed reactive hyperplasia with no evidence of metastasis. 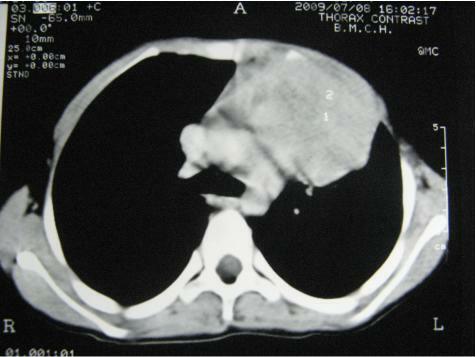 A diagnosis of – Large cell carcinoma Lung, lymphoepithelioma type, was confirmed with stage pT3 N0 M0. In situ hybridization for Epstein Barr virus was not done as we do not have this facility in our institution. So we went for serum anti-EBV IgG which was positive in high titre (179.23 IU/ml). She received 6 cycles of chemotherapy with Cyclophosphamide, Doxorubicin, Cisplatin every 3 weekly interval and 3960cGy doses of radiation in 22 fractions in a span of 4 weeks. Now she is symptom free for more than 2 years and has resumed her studies. The most interesting part of our case is the diagnostic work-up of it that was initially presumed to be a case of thymoma and RNST was done to exclude myasthenia gravis as it may be present in 30-40% of thymoma patients.12 Histopathological examination of the surgical specimen revealed LELC which we never thought of in this tender age. The merit of the case also lies on the fact that it may be the first reported case of primary lympho-epithelioma type lung carcinoma in adolescent age-group, from India, so far our knowledge goes. As she had surgery and received both radiotherapy and chemotherapy, then she responded well to this multimodality approach and at present she is on regular follow-up with no evidence of recurrence of disease. 1. Yoshino N, Kubokura H, Yamauchi S, Ohaki Y, Koizumi K, Shimizu K. Lymphoepithelioma-like carcinoma of the lung: case in which the patient has been followed up for 7 years postoperatively. Jpn J Thorac Cardiovasc Surg 2005 Dec;53(12):653-656. 2. Ho JC, Wong MP, Lam WK. Lymphoepithelioma-like carcinoma of the lung. Respirology 2006 Sep;11(5):539-545. 3. Butler AE, Colby TV, Weiss L, Lombard C. Lymphoepithelioma-like carcinoma of the lung. Am J Surg Pathol 1989 Aug;13(8):632-639. 4. Pittaluga S, Wong MP, Chung LP, Loke SL. 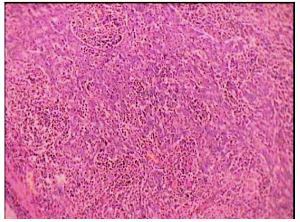 Clonal Epstein-Barr virus in lymphoepithelioma-like carcinoma of the lung. Am J Surg Pathol 1993 Jul;17(7):678-682. 5. Curcio LD, Cohen JS, Grannis FW Jr, Paz IB, Chilcote R, Weiss LM. Primary lymphoepithelioma-like carcinoma of the lung in a child. Report of an Epstein-Barr virus-related neoplasm. Chest 1997 Jan;111(1):250-251. 6. Hoxworth JM, Hanks DK, Araoz PA, Elicker BM, Reddy GP, Webb WR, et al. Lymphoepithelioma-like carcinoma of the lung: radiologic features of an uncommon primary pulmonary neoplasm. AJR Am J Roentgenol 2006 May;186(5):1294-1299. 7. Önal M, Mutlu I, Şipit T, Özaydın HE, Alper A. Primary pulmonary lymphoepithelioma-like carcinoma: a case report. Turkish Respiratory Journal 2006;7(1):25-27. 8. Han AJ, Xiong M, Gu YY, Lin SX, Xiong M. Lymphoepithelioma-like carcinoma of the lung with a better prognosis. A clinicopathologic study of 32 cases. Am J Clin Pathol 2001 Jun;115(6):841-850. 9. Aoki R, Mitsui H, Harada K, Kawamura T, Shibagaki N, Tsukamoto K, et al. A case of lymphoepithelioma-like carcinoma of the skin associated with Epstein-Barr virus infection. J Am Acad Dermatol 2010 Apr;62(4):681-684. 10. Ho JC, Lam WK, Wong MP, Wong MK, Ooi GC, Ip MS, et al. Lymphoepithelioma-like carcinoma of the lung: experience with ten cases. Int J Tuberc Lung Dis 2004 Jul;8(7):890-895. 11. Ho JC, Lam DC, Wong MK, Lam B, Ip MS, Lam WK. Capecitabine as salvage treatment for lymphoepithelioma-like carcinoma of lung. J Thorac Oncol 2009 Sep;4(9):1174-1177. 12. Pan CC, Wu HP, Yang CF, Chen WY, Chiang H. The clinicopathological correlation of epithelial subtyping in thymoma: a study of 112 consecutive cases. Hum Pathol 1994 Sep;25(9):893-899.